Mike from the Phoenix Society of Historical Swordsmanship is ready to be bad. Who are the Historical Opponents? Who are the opponents in our source material? We know that from the masters' own words, often, the opponent was someone who generally knows how to cut and stab with a sword, but lacks a deeper understanding or only has a few techniques in their arsenal. Thus, the historical opponent is often competent and yet ignorant at the same time. "Note how in general all fencers, or all men who hold a sword in hand, even when ignorant in the art of fencing, make use of these seven guards, on which we have seven verses:"
Later on, the author gives advice on how to fence against someone who is a common opponent. "Note that the one who lies above will direct a strike to the head without shield-blow if he is common. But if you want to be informed by the counsel of the priest, bind and press." Another example is the Flower of Battle. Fiore de Liberi's students did not fight one another. We know who they fought- he tells us. These were not novices either, but known military men, some of which, like Boucicaut, had books written about them. Fiore also taught in secret because he says his techniques are easy to learn. He goes on to say he dueled masters who were jealous to learn his art. "Also I say that to whom I have taught this art, I have taught secretly, that there was no person other than the scholar and some close relative of his. Also that those who were present had sworn with sacrament that they would not reveal any play that they had seen from me, Fiore." It's reasonable to assume that Fiore's art was not meant to be opposed to itself, but rather, opposed to those who likely knew what they were doing, but did not know Fiore's art. In most examples of Fiore's techniques, an opponent attacks, but is thwarted. Occasionally, an opponent knows a counter to the technique. Throughout the manuscript, Fiore teases the opponents for knowing little of 'The Art'. "By the grace of God he had let the Recital be written with obscure and disguised words, so that the art shall not become common." "Note, the Recital sets down five obscure hews. Many masters of the sword do know nothing to say about this..."
The opponents mentioned in the Recital and Glosses are dangerous, but, not necessarily fellow disciples of the Recital. When looking at 17th century material, such as rapier, the master often tips his hat as to what is known and what is not. Marco Docciolini in his 1601 treatise describes what 'most' people do when fencing, and how it is inferior to what he teaches. He gives direct comparisons. "There are many who sometimes use the sfalasta to disorder their opponent, which is not likely to end well against the experienced fencer." "Take care not to act as some do, by delivering the imbrocatta all the way to the ground..."
Giganti shows basic fencing, but later notes that many do not know how to fence and gives a variety of examples of what might be encountered by someone untrained in 'proper' fencing. He even chides those who clearly know something, but not enough. "...a gallant man who can thrust, and pass well, but is flawed in countering them, can be said to know nothing." Fabris takes it a step further by showing standard rapier guards and techniques, but, he also shows improvements on the system, giving insight how 'most' use their sword, and how his way is better. 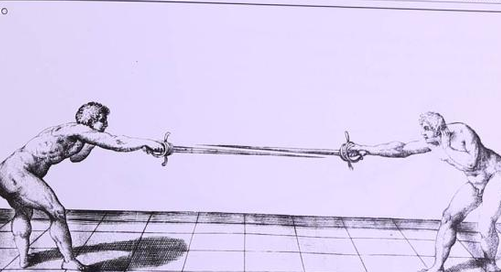 Many of the rapier sources give examples of commonly held bad habits and how to defeat them, ranging from pumping the arm to thrust, to stomping of the foot to be menacing. These are competent opponents in sword and buckler, longsword and rapier, and are different than the bullies that might be mentioned, such as the buffel, peasant, bestial, or hot-blooded man. A long-term project in HEMA is to suss out "What is Common Fencing?" That is not the purpose of this article. Instead, it's to get everyone to understand that the source material isn't always meant to fight itself and the opponents aren't always just wild brutes. There are techniques in most treatises on how to handle the 'bestial man' though he may go by some other name. Additionally, some sources discuss what to do when fencing someone who is skilled. Meyer's longsword, for example, can be seen as a system that is meant to oppose itself- with the context being both opponents are aware of the Fechtschule culture, rules and tools. Giganti has advice on what to do when fencing someone who is superior. Clubs need to teach how to fence against brutes and masters of the art, and they also have to fence someone not using their own system. This is what most clubs do though. They learn a system then have the members fence one another using that system. There is nothing wrong with this and there are many upsides, but, there is some context that is missing. How can students best learn their system if they are always fencing someone who knows it? Yes, they can get trickier and better at it, but, I use another way, as well as free-fencing and line drills, to accomplish this. Fabris' depiction of the third guard, which was commonly used by others, but, he found to be imperfect or improperly formed. Fabris' depiction of the third guard formed properly. While Fabris' work was quite rapidly adopted by many others and he was lauded in his lifetime and beyond. However, at the time he wrote his treatise, he believed he was teaching something new in comparison to what was widely done. When my students are about to fence with the longsword, I will sometimes select one and say, "You're the bad guy." The bad guy stays in the ring and will fence all of the students one by one. My bad guy is a competent, but un-knowledgeable opponent. When it comes to longsword, the bad guy will perform proper cuts and thrusts and at the close will try and push in, seeking to run through their opponent. The bad guy will perform dedicated parries. The bad guy will be plenty dangerous and it's amazing how well they can do! The students need to try and apply their techniques against the bad guy. This isn't a normal drill, because it is still competitive. The bad guy is trying to win, but, he can only use basic techniques to do so. 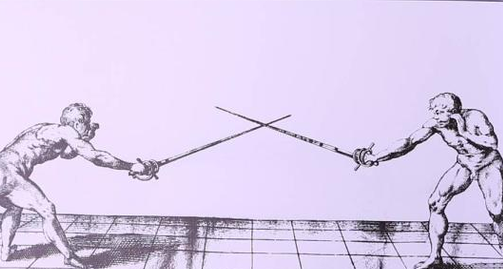 When it comes to rapier, if someone is brand new to rapier, I sometimes show them how to hold a sword, to cut and thrust, to parry and move and nothing else. I then have them fence the students. This bad guy knows just enough to be dangerous and can easily double with the students if they don't fence with caution and apply lessons the masters have for those who don't understand tempo, measure or gaining correctly. Students have to use their basic techniques successfully against an earnest, if not entirely knowledgeable opponent. If we were doing Fiore's wrestling, I would have the bad guy attack first and seek a standard a back-hold grapple. 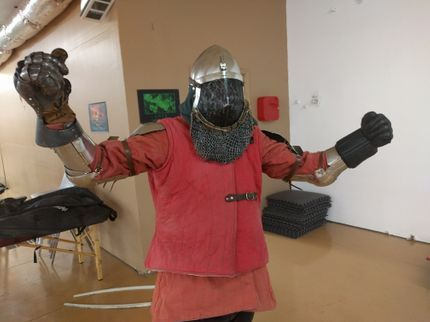 If sword and buckler, I'd have the bad guy throw blows and thrusts and avoid any binding. If saber, I'd have them just throw cuts to the head. This method helps apply knowledge and it works a little better than a line-drill, which is good for form, but poor on application, or free-fencing, in which basic core techniques may not work that often because everyone knows the 'trick'. To get the most out of this way of training, be sure to have a competent bad guy. That means the bad guy is not throwing crazy hard blows, charging madly, or purposefully seeking the double. They are trying to win and stay alive, they just don't have as many tools to use as the students. Hopefully, the students get to apply their system as it was intended against an earnest and not entirely unskilled opponent! Like my articles? Then be an investor in product! That's a fancy way of me asking you to buy a book. 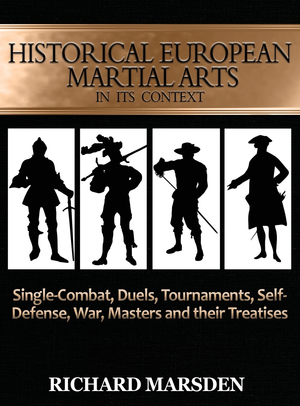 As of December 1 2018, HEMA in its Historical Context was on sale for $44 instead of $59 in hardback. Check it out and help me out and get a great price from Amazon. There is no way the sale will last, so take advantage! THANKS to everyone who has supported Tyrant Industries in the past!